Once you have homemade hashbrowns from scratch, it's hard to stomach the frozen kind. 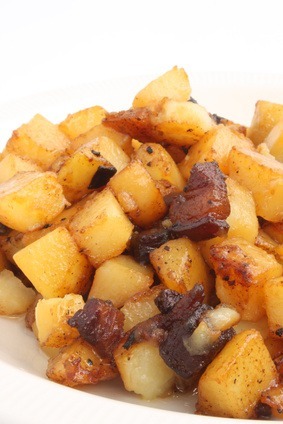 I have also posted delicious potatoes side dishes that go hand-in-hand with a hearty breakfast. These are restaurant quality hash browns and now you can make them at home. I always use Russet potatoes for all the breakfast potato recipes that you will find below. Make sure you rinse the potatoes after cutting and dry them with a clean towel. Simple tips that make all the difference. 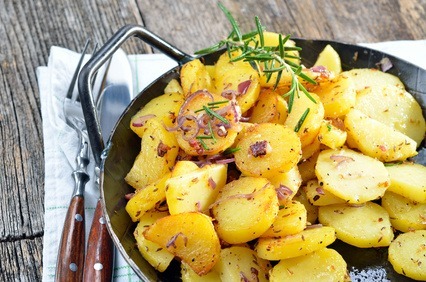 If you are in a hurry, just microwave the cut-up potatoes for 2 minutes and they will fry up faster so you don't burn them waiting for the centers to be done. Now on to my homemade hashbrowns from scratch. These homemade hash browns are golden and crispy on the outside and creamy in the middle. 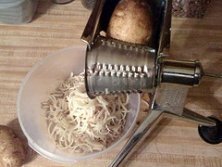 Shred potatoes with a box grater. The photo is using a Salad Master attachment. Rinse shredded potatoes until water is clear, then drain and squeeze dry. Fry the bacon, drain and crumble; set aside. Drain water from potatoes and squeeze dry. 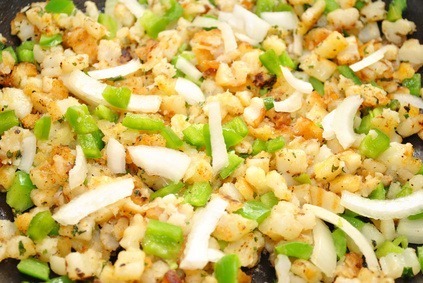 Place shredded potatoes in a bowl, and mix in the onion, flour, spices and egg until evenly distributed. Season with salt and pepper to taste. At this point, you can make a full pan of hash browns or hash brown patties. Heat about 1/4 inch of oil (give or take 1 cup) in a large heavy skillet over medium-high heat. When oil is sizzling hot, place potatoes into the pan in a 1/2 inch thick layer. Cover the whole bottom of the pan, or make separate piles like pancakes. Cook until nicely browned on the bottom, then flip over and brown on the other side. It should take at least 5 minutes per side. If you are cooking them in one big piece, it can be cut into quarters for easier flipping. Remove from pan, and drain on paper towels. Season with salt and pepper and serve immediately. Delicious homemade hashbrowns. 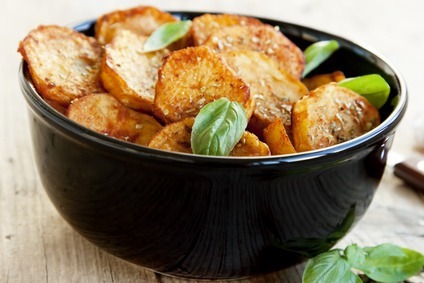 Cut potatoes into 1/2 inch thick rounds and in a bowl, mix potatoes with olive oil and spices to taste. Place potatoes on parchment paper spaced evenly and bake for 15 minutes. Bring potatoes out of the oven, turn over and bake another 15 minutes. Continue baking and turning over every 15 minutes until potatoes are well browned. Potatoes should be crispy on the outside and soft in the middle. Recipe adapted from Chef John on AllRecipes.com. If you like your home fries crispy, do not cover them with the pan lid. Just rinse cubed potatoes with water and make sure they are towel-dried when you place them in the hot oil. Fry the bacon and onion together in a heavy skillet or cast iron pan until onion is translucent - drain (or keep to fry up the potatoes) and set aside. You may fry the potatoes in the bacon drippings as noted above or remove and add the butter and olive oil. Fry potatoes and turn frequently until brown and crisp on all sides. More than homemade hashbrowns, I have another recipe for breakfast potatoes. **Do not slice the potatoes too thin because when they are frying they will stick together in a clump (see photo above for reference). Heat butter and oil in a heavy skillet on medium high and add rinsed and towel-dried potatoes. Fry for a few minutes and turn over. Now you may use the garlic and onion powder because all the seasonings will stick so much better on oil-coated potatoes. Let them fry for a few minutes and turn over again until all potatoes are browned and tender in the center. Cut up the potatoes and rinse well under water and dry with a towel. Cut the pepper(s) and onion. Heat up the skillet on medium-high and add the butter and olive oil. When hot, add the potatoes, bell pepper and onion. Turn everything over every few minutes so it doesn't burn. Season with salt and pepper. Potatoes are done when browned and tender in the inside. I have more then homemade hash browns, be certain to check out more potato recipes below.